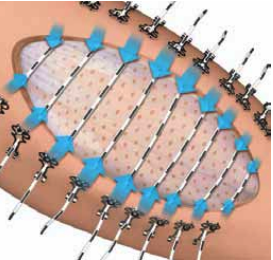 ABRA Surgical closes retracted skin defects through chronic cyclic tension. A sound primary closure replaces skin grafting and the associated rehabilitation, pain, and loss of function. ABRA Surgical is indicated for use in preventing, controlling, reducing, and closing retracted soft tissue defects.